My sister, having so much to do, was going to church vicariously, that is to say, Joe and I were going. In his working—clothes, Joe was a well-knit characteristic-looking blacksmith; in his holiday clothes, he was more like a scarecrow in good circumstances, than anything else. Nothing that he wore then fitted him or seemed to belong to him; and everything that he wore then grazed him. 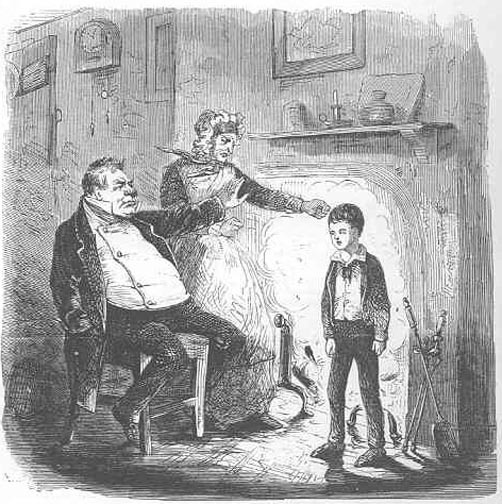 On the present festive occasion he emerged from his room, when the blithe bells were going, the picture of misery, in a full suit of Sunday penitentials. As to me, I think my sister must have had some general idea that I was a young offender whom an Accoucheur Policeman had taken up (on my birthday) and delivered over to her, to be dealt with according to the outraged majesty of the law. I was always treated as if I had insisted on being born in opposition to the dictates of reason, religion, and morality, and against the dissuading arguments of my best friends. Even when I was taken to have a new suit of clothes, the tailor had orders to make them like a kind of Reformatory, and on no account to let me have the free use of my limbs. The apparition of a file of soldiers ringing down the but-ends of their loaded muskets on our door-step, caused the dinner-party to rise from table in confusion, and caused Mrs. Joe re-entering the kitchen empty-handed, to stop short and stare, in her wondering lament of "Gracious goodness gracious me, what's gone—with the—pie!" "With you. Hob and nob," returned the sergeant. "The top of mine to the foot of yours,—the foot of yours to the top of mine,—Ring once, ring twice,—the best tune on the Musical Glasses! Your health. May you live a thousand years, and never be a worse judge of the right sort than you are at the present moment of your life!" The soldiers were moving on in the direction of the old Battery, and we were moving on a little way behind them, when, all of a sudden, we all stopped. For there had reached us on the wings of the wind and rain, a long shout. It was repeated. It was at a distance towards the east, but it was long and loud. Nay, there seemed to be two or more shouts raised together,—if one might judge from a confusion in the sound. "Take notice, guard,—he tried to murder me," were his first words. "Tried to murder him?" said my convict, disdainfully. "Try, and not do it? I took him, and giv' him up; that's what I done. I not only prevented him getting off the marshes, but I dragged him here,—dragged him this far on his way back. He's a gentleman, if you please, this villain. Now, the Hulks has got its gentleman again, through me. Murder him? Worth my while, too, to murder him, when I could do worse and drag him back!" The other one still gasped, "He tried—he tried-to—murder me. Bear—bear witness." "Lookee here!" said my convict to the sergeant. "Single-handed I got clear of the prison-ship; I made a dash and I done it. 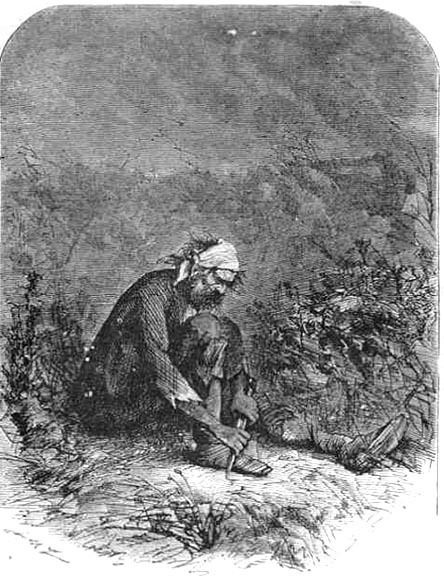 I could ha' got clear of these death-cold flats likewise—look at my leg: you won't find much iron on it—if I hadn't made the discovery that he was here. Let him go free? Let him profit by the means as I found out? Let him make a tool of me afresh and again? Once more? No, no, no. If I had died at the bottom there," and he made an emphatic swing at the ditch with his manacled hands, "I'd have held to him with that grip, that you should have been safe to find him in my hold." "I know, but this is another pint, a separate matter. A man can't starve; at least I can't. I took some wittles, up at the willage over yonder,—where the church stands a'most out on the marshes." "It was some broken wittles—that's what it was—and a dram of liquor, and a pie." "So," said my convict, turning his eyes on Joe in a moody manner, and without the least glance at me,—"so you're the blacksmith, are you? Than I'm sorry to say, I've eat your pie." "God knows you're welcome to it,—so far as it was ever mine," returned Joe, with a saving remembrance of Mrs. Joe. "We don't know what you have done, but we wouldn't have you starved to death for it, poor miserable fellow-creatur.—Would us, Pip?" Mr. Wopsle's great-aunt, besides keeping this Educational Institution, kept in the same room—a little general shop. She had no idea what stock she had, or what the price of anything in it was; but there was a little greasy memorandum-book kept in a drawer, which served as a Catalogue of Prices, and by this oracle Biddy arranged all the shop transaction. Biddy was Mr. Wopsle's great-aunt's granddaughter; I confess myself quiet unequal to the working out of the problem, what relation she was to Mr. Wopsle. She was an orphan like myself; like me, too, had been brought up by hand. She was most noticeable, I thought, in respect of her extremities; for, her hair always wanted brushing, her hands always wanted washing, and her shoes always wanted mending and pulling up at heel. This description must be received with a week-day limitation. On Sundays, she went to church elaborated. "Whatever family opinions, or whatever the world's opinions, on that subject may be, Pip, your sister is," Joe tapped the top bar with the poker after every word following, "a-fine-figure—of—a—woman!" "And I ain't a master-mind," Joe resumed, when he had unfixed his look, and got back to his whisker. 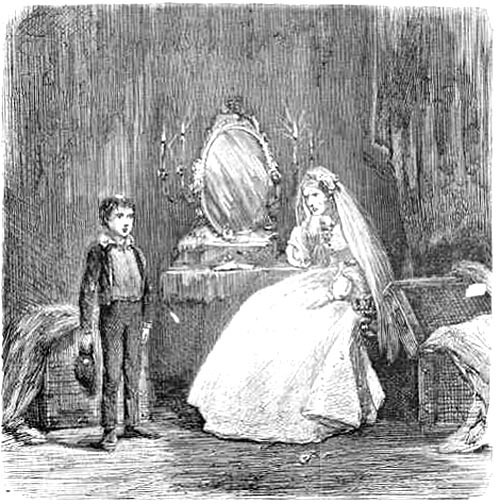 "And last of all, Pip,—and this I want to say very serious to you, old chap,—I see so much in my poor mother, of a woman drudging and slaving and breaking her honest hart and never getting no peace in her mortal days, that I'm dead afeerd of going wrong in the way of not doing what's right by a woman, and I'd fur rather of the two go wrong the t'other way, and be a little ill-conwenienced myself. 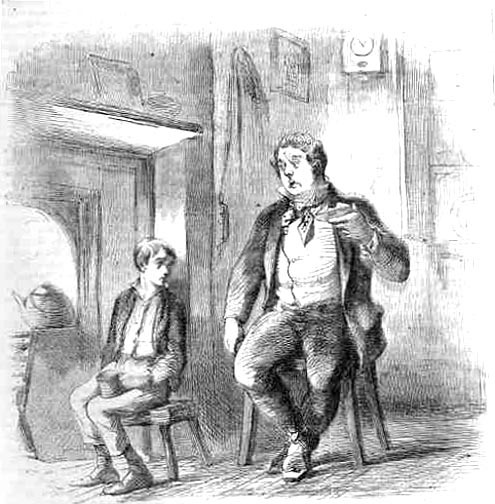 I wish it was only me that got put out, Pip; I wish there warn't no Tickler for you, old chap; I wish I could take it all on myself; but this is the up-and-down-and-straight on it, Pip, and I hope you'll overlook shortcomings." We went into the house by a side door, the great front entrance had two chains across it outside,—and the first thing I noticed was, that the passages were all dark, and that she had left a candle burning there. She took it up, and we went through more passages and up a staircase, and still it was all dark, and only the candle lighted us. "But not all of it? Why sure you don't mean to say, Pip, that there was no black welwet co—ch?" For, I stood shaking my head. "But at least there was dogs, Pip? 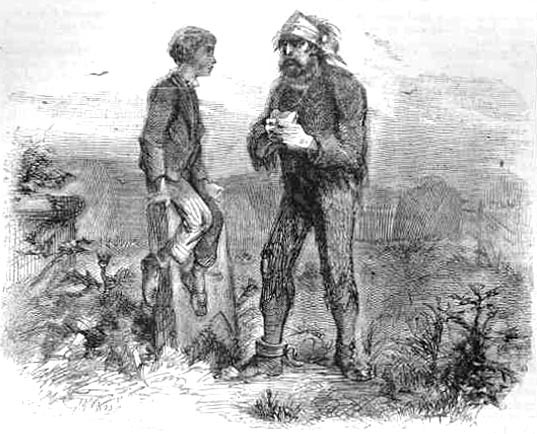 Come, Pip," said Joe, persuasively, "if there warn't no weal-cutlets, at least there was dogs?" 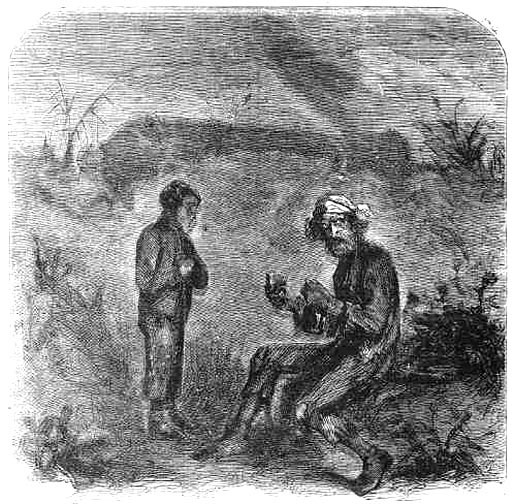 "Well, Pip," said Joe, "be it so or be it son't, you must be a common scholar afore you can be a oncommon one, I should hope! The king upon his throne, with his crown upon his ed, can't sit and write his acts of Parliament in print, without having begun, when he were a unpromoted Prince, with the alphabet.—Ah!" added Joe, with a shake of the head that was full of meaning, "and begun at A. too, and worked his way to Z. And I know what that is to do, though I can't say I've exactly done it." The Educational scheme or Course established by Mr. Wopsle's great-aunt may be resolved into the following synopsis. The pupils ate apples and put straws down one another's backs, until Mr. Wopsle's great-aunt collected her energies, and made an indiscriminate totter at them with a birch-rod. 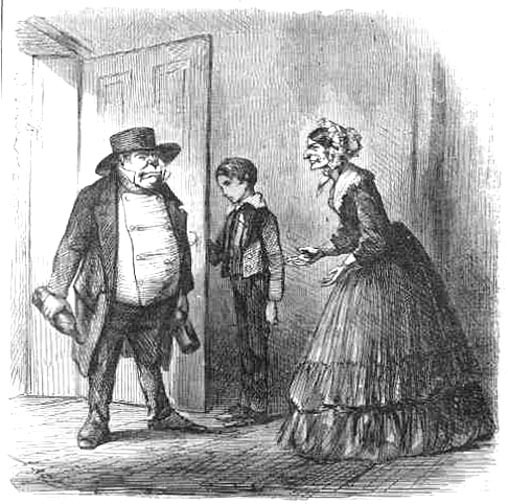 After receiving the charge with every mark of derision, the pupils formed in line and buzzingly passed a ragged book from hand to hand. 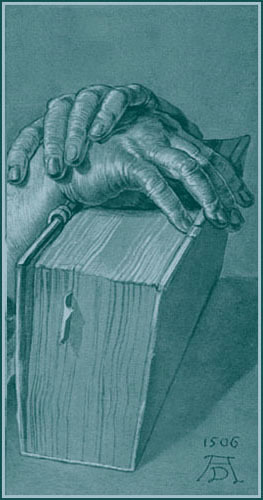 The book had an alphabet in it, some figures and tables, and a little spelling,—that is to say, it had had once. As soon as this volume began to circulate, Mr. Wopsle's great-aunt fell into a state of coma, arising either from sleep or a rheumatic paroxysm. 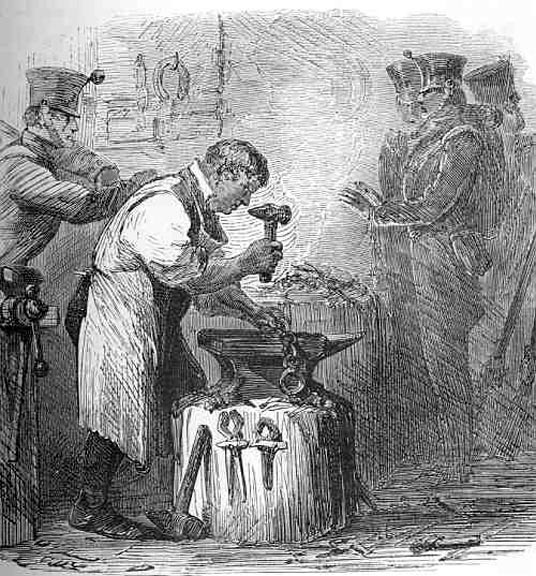 The pupils then entered among themselves upon a competitive examination on the subject of Boots, with the view of ascertaining who could tread the hardest upon whose toes. This mental exercise lasted until Biddy made a rush at them and distributed three defaced Bibles (shaped as if they had been unskilfully cut off the chump end of something), more illegibly printed at the best than any curiosities of literature I have since met with, speckled all over with ironmould, and having various specimens of the insect world smashed between their leaves. This part of the Course was usually lightened by several single combats between Biddy and refractory students. When the fights were over, Biddy gave out the number of a page, and then we all read aloud what we could,—or what we couldn't—in a frightful chorus; Biddy leading with a high, shrill, monotonous voice, and none of us having the least notion of, or reverence for, what we were reading about. When this horrible din had lasted a certain time, it mechanically awoke Mr. Wopsle's great-aunt, who staggered at a boy fortuitously, and pulled his ears. This was understood to terminate the Course for the evening, and we emerged into the air with shrieks of intellectual victory. 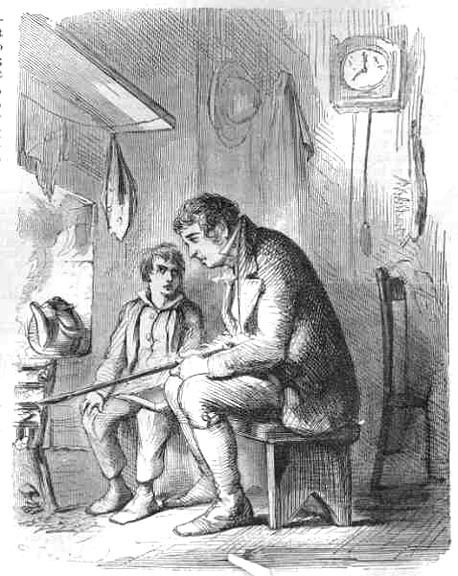 It is fair to remark that there was no prohibition against any pupil's entertaining himself with a slate or even with the ink (when there was any), but that it was not easy to pursue that branch of study in the winter season, on account of the little general shop in which the classes were holden—and which was also Mr. Wopsle's great-aunt's sitting-room and bedchamber—being but faintly illuminated through the agency of one low-spirited dip-candle and no snuffers.